I originally cooked this as 2 intact chicken breasts and sliced them to put on a salad. 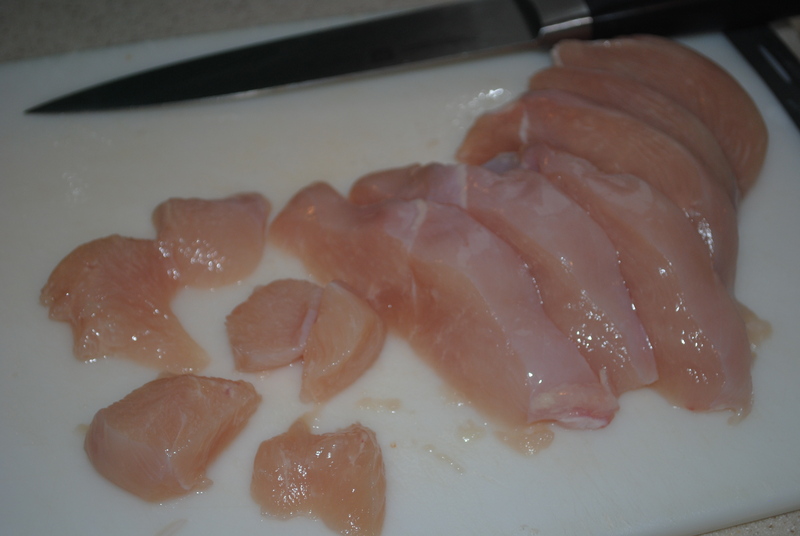 My kids suggested cutting up the raw chicken into pieces and we realized we had just created homemade chicken nuggets! The dressing is intended to go over the salad, but my husband considers it “dipping sauce” for the nuggets. Although these could be made with traditional store-bought breadcrumbs, I make a habit of tearing up any uneaten bread, cooking the pieces in a warm oven until dry and then grinding them in the Cuisinart – I add them to a freezer-bag I keep in the freezer so that I always have “fresh” breadcrumbs on hand. To prepare the chicken, set up 3 shallow bowls as follows: 1) flour mixed with the salt and pepper; 2) egg, whisked; 3) breadcrumbs. Dredge each piece of chicken first through the flour mixture (shaking off any excess), then the egg and lastly the breadcrumbs, being careful to adhere as much of the breadcrumbs to the chicken as possible. Set aside each prepared chicken strip onto a drying/cooling rack (the kind you’d use to cool cookies). Continue with each piece until done. Add olive oil to a large non-stick ovenproof skillet and warm over medium-high heat. Carefully lay chicken strips into warm oil and cook – without flipping them – until chicken is golden brown on one side, about 3-5 minutes. 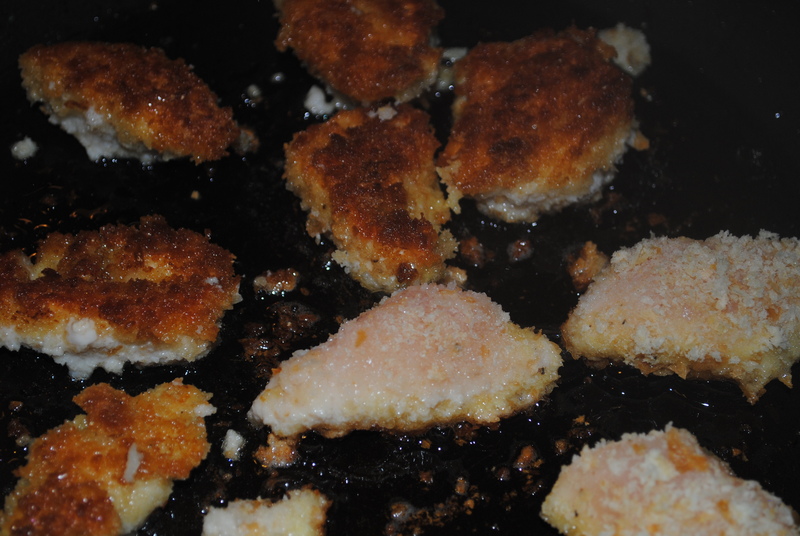 Carefully flip each chicken strip (so as not to lose all the breadcrumbs) and transfer the skillet to the oven to finish cooking, about 8 minutes, until opposite side is also golden brown. While chicken bakes, combine dressing/sauce ingredients in a small bowl and whisk until fully incorporated. Serve on a salad with the chicken or on the side as a dipping sauce.